The reason Ultimate Ninja 4 was hard to find may be because of Naruto Ultimate Ninja Storm releasing 2008 and 4 releasing 2009. Also with Ultimate Ninja Storm 2 releasing in 2010, there wouldn’t be a reason to continue with Ultimate Ninja 5 on the PS2. At this point, we are heading to Ultimate Ninja’s big move from a 2D fighter, to a 3D. Naruto: Ultimate Ninja Storm: A new way to introduce fans new and old to Naruto was to completely start from the beginning and in 3D. Storm only keeps a few elements from the original Ultimate Ninja lineup, but takes a bit from each game. For the story mode, an RPG format was kept where you could freely travel all around the areas that followed the story and a bit beyond. The battle system was heavily altered, but easy to get adjusted to. The biggest change being the game was now in full 3D. Support characters returned and became a main staple, Boss Battles for story mode were implemented, and one of the best changes: Awakening. When your health drops to a certain amount, your character is able to transform and/or gain a heavy burst of power. This mode is only limited for a certain amount of time, so it would be best for you to finish your opponent off quickly. All in all, this game was a great start to Naruto’s move into the next-gen(of then). Naruto Shippuden: Ultimate Ninja Storm 2: Keeping almost everything from before, Storm 2 continues the story of Naruto up until Pain’s attack on Konoha. The battle system wasn’t changed except for a few things, when caught in an Ultimate Jutsu there is no way to stop it or take less damage, you had the option to play without support characters and you could now unleash a Team Ultimate Jutsu with your support characters.. Other than that, the game is basically the same except with a roster increase of 25 to 42. However, two things that did change the game a bit was a guest fighter: Lars Alexandersdon from Tekken 6. He was one of my favorite characters to play, however he only stayed for that game. And the addition of online play, where you could battle many other players across the globe. This also was the first time the Ultimate Ninja series made its way onto Xbox 360. 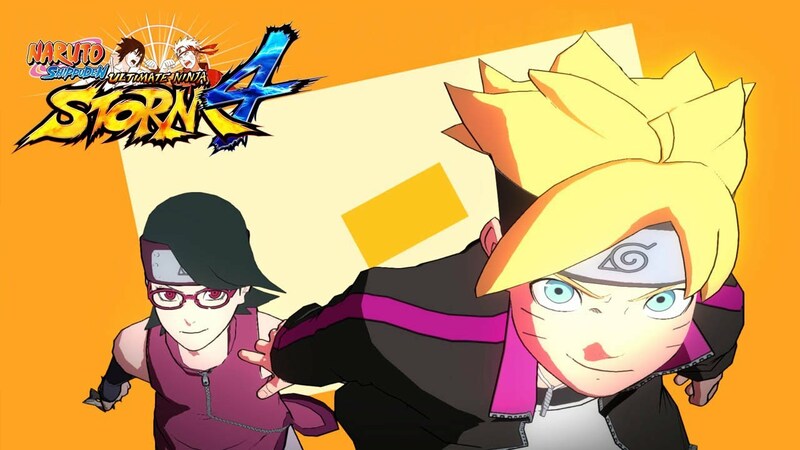 Naruto Shippuden: Ultimate Ninja Storm Generations: With new characters being added and having Tournament and Challenge mode implemented, there isn’t much to say about this game. As an anniversary title, it didn’t do much for the Naruto series. The story mode was changed similar to Ultimate Ninja 1, where you could choose certain character’s stories and play them. Other than that, cutscenes were made to be just like the anime. It wouldn’t be best to get this game at all, unless you wanted it to complete your Naruto collection. Naruto Shippuden: Ultimate Ninja Storm 3: Continuing the story from Storm 2, Storm 3 lasts until the climax of the Third Great Ninja War. With hardly any changes on the battle system, a new feature was implemented on states. When fighting on a stage that has a cliff or edge, you can knock fighters against that edge 3 times for a ring out and automatic win. The story retains its function as last time, except for most boss battles. When entering a boss battle, the player is able to choose the difficulty of Legend and Hero. Depending on the difficulty you choose, different takes on the battle and cutscenes will happen and may even unlock secret cutscenes. Even though the game is a bit outdated because of Revolution, I would still suggest buying it. There is also DLC that takes the story a bit further with Sasuke, Itachi and Kabuto. Naruto Shippuden: Ultimate Ninja Storm Revolution: Being the last Storm game for PS3, it had to go out with a bang and a lot of fun. With 118 characters in the roster and the special Mecha-Naruto character, things were sure to change. For the battle system; some characters now have two stage awakenings, a new form of Team Ultimate Jutsus were created where if you make a team between certain characters, they will have their own combination attack. A new support system was created, counterattacking, guard breaking and some other cool things. The game has 4 separate stories for you to play through, to avoid spoilers I’ll only say that one of the stories features Mecha-Naruto. A new game mode was added called Ninja World Tournament, where you face off against three CPU to collect as many orbs as possible in an all-out battle royal. This mode is very similar to the Clash of Ninja Revolution series on the Wii, so people who’ve played those games may find this easy. With this being the latest game in the franchise and the last one for PS3, you should definitely pick it up if you want to have a good time. With Revolution being the latest installment of the series, the retrospective is almost over. The final part will talk about Storm 4 and what we have seen since its announcement to now. Ever since October 23rd, 2003(June 26, 2006 for America); fans of the popular anime, Naruto, were able to fight with their favorite characters too become the ultimate ninja. This retrospective will go into detail of the Ultimate Ninja series, from Ultimate Ninja 1 to Ultimate Ninja Storm Revolution. Naruto: Ultimate Ninja: Starting its series on the Playstation 2, Naruto Ultimate Ninja was a very good game with a small roster. The game’s story mode only lasted until Orochimaru invaded Konoha, but you were able to play within the perspective of each character. The battle system is very simple and easy to get used to, and was staple throughout the series that worked. Characters battled on foreground and background planes, unleashing combos and Ultimate Jutsus. For a small game, it was very fun to play with friends when not playing the story. To go back and play it now however, isn’t something you should do. Naruto: Ultimate Ninja 2: Right in the year after, a sequel title to Ultimate Ninja was released. Personally, this was my favorite out of the Playstation 2 titles. Unlike Ultimate Ninja 1, Ultimate Ninja 2 changes up a bit of the formula. Instead of having the story mode similar to a manga, story mode was made to be like an RPG. Not only were you able to just play the story this way, but you could also have other characters challenge you to gain money or items. The roster was made bigger, from 14 to 32 characters and a bit of the battle system was changed. You were now able to choose any characters as a support character and you could also transform in battle. Another big change was with Ultimate Jutsus, originally when it was activated both players had to input button commands quickly in order to take less damage or continue onto the next phase. In Ultimate Ninja 2, a lot more phases were added and 2 different ways to stop them were added: button mashing and analog rotation. Even with the release of Ultimate Ninja 3, this game still remains my favorite on the Playstation 2. Naruto: Ultimate Ninja 3: Ultimate Ninja 3 was the last game that followed the original story, until Storm began. The only differences made between this game and the last ones were the removal of phases in Ultimate Jutsus, removal of the support characters but the ability to customize your characters was implemented and you could use the summoning jutsu to enter a giant battle. The story mode was no longer like an RPG, it was broken down into arcs. However, there was a new mode implemented: Ultimate Contest. This mode was given the RPG playing style, where you battle other characters for their crystals. After completing the contest, you are allowed to roam and continue playing freely. 10 new characters were added onto the roster, and this isn’t counting transformations. With this game, you’re sure to have a great time fighting your friends and with Ultimate Contest. There are 2 other games that followed into the Ultimate Ninja series. However, with Naruto Shippuden: Ultimate Ninja 4 being difficult to find and Naruto Shippuden: Ultimate Ninja 5 never coming to the Americas, I won’t be able to cover them. However, I will say that Ultimate Ninja 5 has the best opening. The next parts of this retrospect will talk about the Ultimate Ninja Storm series and the upcoming Ultimate Ninja Storm 4. Fragments of Horror contains several short horror stories with a variety of themes. From a girl who is obsessed with being cut open to a writer that kidnaps her fans in order to find the perfect writing material. 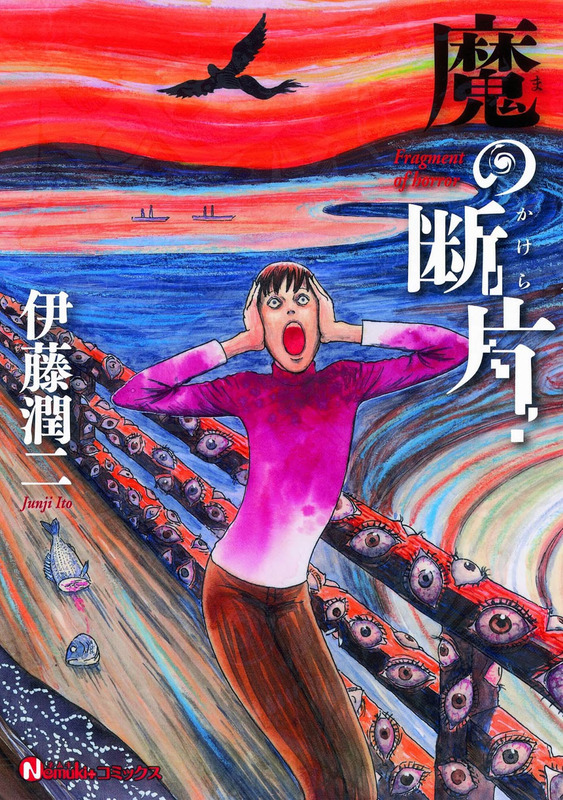 Junji Ito demonstrates in Fragments of Horror that terror can come in all forms. For readers that are used to reading serialized manga, it might be a bit difficult to relate or understand the characters. Simply for the fact that the characters themselves are used as disposable puppets in order to tell the story. Junji Ito’s works are a reminiscent of old school manga in terms of storytelling and art direction. While the artwork might be different in comparison to the clean lines and minimal design of modern manga, it’s filled with intricate details that describes the madness and terror of his story. Horror is a very tough genre to execute. What may be scary for one individual might not work for another person. There’s also the issue of being predictable simply because the horror genre encourages characters to be tossed away like disposable tissues. While Junji Ito’s works are classified as horror, it does not mean every page will be filled with gore or explicit images that promote shock values over a proper narrative. The merriam-webster dictionary defines horror as “a very strong feeling of fear, dread and shock”. This collection of horror stories focuses more on the dread and shock portion of horror. As I mentioned earlier that horror can be a tricky genre to work with due to it being predictable. However Junji Ito uses this factor of predictability in order to create a mysterious element within his stories. For example in one of the story “A Gentle Goodbye” describes the process of mourning and how one copes with it. It begins with Riko, a girl who is frighten by the idea of losing her father. The scene then transitions to her traditional marriage with the Tokura family. However it is revealed that her husband’s family did not want the marriage to happen in the first place. Despite her effort to fit in and please her relatives, nobody wants to interact with her. A little bit afterwards, she discovered that the Tokura family has a tradition of creating afterimages of their deceased family members. Essentially they’re ghost versions of the people that are dead, however the ghosts aren’t alive but rather they’re delusions created by the living. This essentially describes how when a person passes away, the dead lives on within our memories. Riko’s husband comments that the afterimages can’t say anything that “surpasses the expectations of the living”, hints that the images are metaphorical representations of how our memories of the deceased remains unchanged after they pass away. One of Riko’s dream is that her father turned into a toy and “at first [she] loved it and played with it. But…in the end, [she] left it in the drawer. And then as the long months passed…[her] toy father went off somewhere without [her] realizing [it]. The drawer represents the coffin where the dead resides and the toy father represents the living’s perception of the dead. This part describes how after someone passes away, the mourners often wishes they spent more time to play with the deceased. However as the long months passed the mourners would eventually forget about the dead and move on with their lives. Overall Fragments of Horror by Junji Ito contains some of the most bizarre, grotesque and intriguing short stories within the manga world. His old school art style might not be suitable for those that are used to modern day manga, however his style really does bring out his unique ideas of what horror manga can look like. Most of his stories are interesting to read because of how well Ito pushes the boundaries between the supernatural world and how people would react to these supernatural events. Some of his stories can be looked at from different angles in order to interpret the hidden messages, which can be fun on its own but not necessary if you simply want to enjoy a good manga from the beginning to the end. I recommend this manga to those looking for something light to read or those that simply love horror. Hopefully Viz will publish more of Junji Ito’s works in the future. As it is already well known, this year Nintendo added a new member to the handheld family: the New Nintendo 3DS. The name isn’t the only thing new about the system, the system is faster than the previous 3DS, has Amiibo functionality and some exclusive games. For those that would look into getting a 3DS in general, here are just a few games that are definitely worth the wait. Animal Crossing New Leaf: This game is almost like My Sims Kingdom, I should have my 3DS confiscated for saying that but let me finish. The fact that you own a home, is similar to My Sims Kingdom. However, this game is far better than that. In New Leaf, you travel to the town that you randomly name but are mistaken as the new Mayor. Even though this was a mistake, you take responsibility for this and enjoy life in your own town full of animals. After gaining the towns 100% trust, you’re able to build foundations an d just continue enjoying life as the Mayor. The game never ends and is also real-time based, so the only way you can get a game over is if you neglect the game. Trust me, if you’re gonna play this game make sure you play for at least an hour a day. Fire Emblem Awakening or Fates(If): I haven’t played either of these games, also considering the fact that Fates hasn’t released in America yet. However if you’ve played Smash Bros., then you should know what Fire Emblem is. That enough makes you want to learn of it, and you’ll learn that Awakening is a great game. It’s a turn-based RPG and that is something I’m a sucker for. So if you like turn-based games or maybe even the Disgaea games, you would like this game. Now with Fates, thats something I can highly recommend. From the other gameplay attributes of creating your own Kingdom, amiibo functionality and even the amazing music offered, this game is something you should definitely get behind. Kingdom Hearts Dream Drop Distance: If you’ve played the Kingdom Hearts game and actually care about the story, definitely get this title. Dream Drop Distance not only adds a lot more to the story with more things that may be hard to understand, but it also changes up the way we’ve known to play(again). The combat is still a bit the same, however a new mechanic was added to also help with movement and fighting: Flowmotion. Grinding and flying across the skies, Flowmotion will help you offensively and defensively so get used to it. Lastly, one of the best things about this game is that you can also play as Riku and The World Ends With You makes an appearance. This game, as much as people hate the multi-platform side of it, is amazing. I’ve beaten the game in 5 days, so you can buy this game, beat it and then get your money back. But if you want to keep the game, do it because its worth it. These are just three games for you to try out though. There are still many games in the 3DS library for you to enjoy, Japanese or English. Fire Emblem If has released in Japan already, so you can purchase a card from us in order to get it! Shoya Ishida isn’t a fan of boredom. His daily activities involve jumping off bridges and getting into fights with older men. He fights not for some lofty goal but because he is bored. What starts out as an innocent endeavor eventually leads to Shoya’s realization that he must grow up. However he ignores his friend’s warning to mature and declares that life is a war against boredom. Koe no Kitachi or A silent voice in the U.S release is a manga written by Yoshitoki Oima that is an emotional read that explores the motives and impact of childhood bullying through its two main characters Shoyo Ishida and Shoko Nishimiya. The manga originally started as a one-shot and was later expanded into seven separate volumes. The reader will not need to read the one-shot before they start this manga. The one-shot is included in this manga and have been expanded to fit a full volume. Currently there are two volumes released in the U.S. While this may seem little in comparision to other manga, each volume feels like a separate story on its own. It reads more like a series of novel rather than a weekly serialization. This story is by no mean slow, but don’t expect there to be excitement every 10 page or so. The plain character design shows how Shoyo views people as simply a way to relieve his boredom. From jumping off bridges with his friends to getting into fights and bullying Nishimiya, all of Shoya’s reasons for his actions were simply because he was bored. Another noticable thing about the art direction of this manga was how subtle the author kept the story. Shoya began as a mischievous punk who only did stupid things to entertain himself but ends up being shun by his close friends. The bruises and marks on Shoya were a minor addition to his character throughout the pages. The mangaka never explicitly shows Shoya being beaten by his friends until later in the manga. This illustrates how bullying can start off as minor incidents and then escalates into major ones. 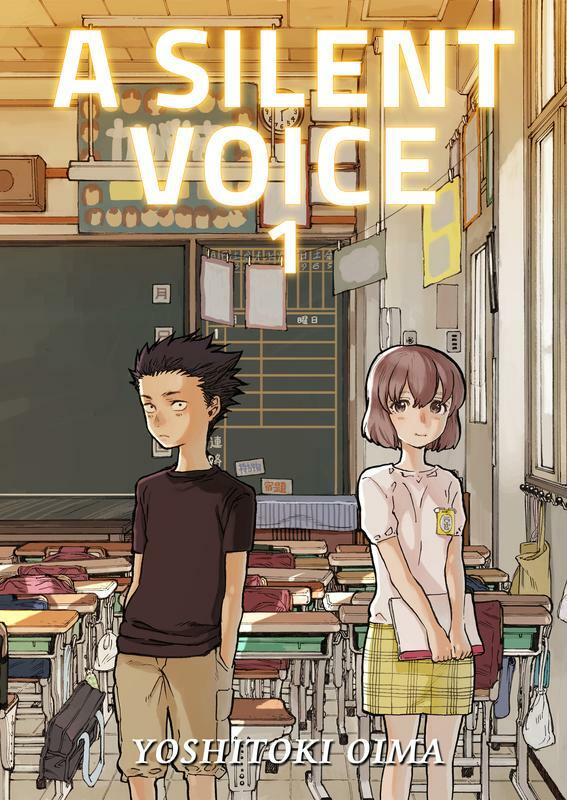 A silent voice is an easy read but its subject matter can leave readers uncomfortable with the realities of bullying. For readers that are looking for escapism and delightful humor within their manga, look elsewhere. A silent voice tackles on the subject of bullying head on, similar to Shoya’s attitude on boredom. It is a refreshing read amongst the sea of battle fantasy manga and gag manga. But rest assure a silent voice’s story is a good story even with a tough subject matter such as bullying. It’s hard not to recommend this manga. Even if you are not a fan of school settings in manga and anime, a silent voice destroys the anime shool cliché and fills it with reminders of how difficult it is to grow up. Especially if you grew up different amongst your peers. The first volume can be read as a one-shot so in theory you could read the first volume and be done with the series. But I’m curious about what the author has packed for the next 6 volumes. Of course I’ll be picking up the remaining volumes, it’s just a matter of waiting for the U.S release to come out. Koe no Kitachi can be previewed on crunchyroll for free, give it a try if you’re still on the fence about this series. It’s hard to believe it’s already been nearly 10 years since the first Death Note live action film was released (and a cruel reminder of how old I’m getting (´；ω；｀)), but the Death Note fan base is still alive and well after all these years. 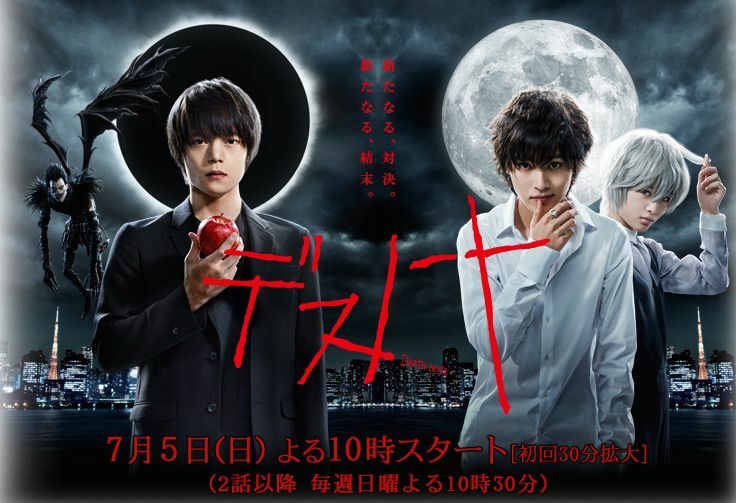 The new Death Note live action drama, which started airing on July 5th of this year, sports a new cast, new story developments, and breathes new life into the franchise as a whole. The story is an alternative rendition of the original Death Note. Light Yagami (played by Masataka Kubota ) is a college student who works a part time job. One evening, he and a classmate are harrassed by a thug who they both have gone to school with in the past. He proceeds to steal Light’s cell phone, as well as taunt him with a knife. As Light makes his way home, frustrated and feeling defeated, he stumbles upon the Death Note. From there, his journey toward becoming the “God of the new world” , Kira, begins. Many people who have watched the Death Note anime and the 2006 movies will find many differences in terms of both character personalities, and story development, such as Light’s mother having passed away. Many characters who appeared much later in the original series , such as Misa Amane (played by Hinako Sano) and N (played by Mio Yuki), will appear very early on (within the first 2 episodes, actually). This is most likely for the sake of showing the development of character’s relationships throughout the drama – something I felt was not very well done in the original story, and I personally am looking forward to seeing these characters develop. Fear not, veteran Death Note fans: This drama was not made to overshadow the original story. Along with this simply being an alternate take on Death Note, the relatability with the key characters is far better than the original. Light Yagami was, in addition to being down right cold blooded, a perfectionist (if not just down right perfect) in the original story. From his looks to his intelligence; he had it all. Light Yagami in the 2015 adaptation comes across as far more “human”, and relatable for most. He is insecure, has normal human faults, and is less quick/willing to kill people using the Death Note. Of course we can’t forget everyones favorite secretive detective – L (played by Kento Yamazaki) has also given the original L role quite a spin. L actually able to stand up-right and walk around (anyone who’s watched or read the original Death Note would understand how much of a BIG DEAL this is…) , and he is far more crued and vein. He wears only button up shirts, and switches into a freshly ironed one whenever he can. The 2 rivals seem more like opposites in this adaptation than in the original, and so far I am liking the way the story is developing. While only 3 episodes have been released thus far, Death Note 2015 is a drama worthy of it’s name, and is an intense and mystifying experience for both old fans of the franchise, and new comers alike. After already making its way on the PS2 and PSP with Disgaea 2, the Disgaea franchise was ready to move forward. Those steps forward led to the next game being on the PS3, Disgaea 3: Absence of Justice. With the story not having a direct plot point direction with Disgaea 1 or 2, Disgaea 3 tells the story of Mao, a young demon that is the #1 honor student at Evil Academy, that plans to defeat his father: The Overlord and Principal. The reason being why he is doing this is because his dad keeps stepping on his Slaystation 3. However, thats not the only reason you’re traveling through different lands in the Netherworld. At the beginning of the story you’ll meet Almaz, a young man who has entered the Netherworld in order to find Princess Sapphire. Soon after just meeting him, you make him your vassal and also end up having your childhood rival, Raspberyl, join your team. There are still many attributes to the story, but also to the games mechanics. From previous Disgaea games, Geo Panels come in a new form as Geo Blocks. The more blocks stacked together, the bigger their effects influence the battles. A new mechanic introduced from Dark Hero Days returns as a staple into the series: Magichange. When having a monster character next to a humanoid character, you have the option of increasing your strength by using your monster as a certain weapon. This isn’t the only way of combining strength, when using certain special attacks against the same enemy, you can rack up damage and take them out easier. Similar to the Item World is the Class World, where you can increase and improve some of your character’s attributes and skills. Overall, Disgaea 3 is a great game. It takes some of the systems that worked in Dark Hero Days and other games, and makes it a lot more fun. With new weapons that are available and a more ways to become stronger, you’ll be sure to reach 1,000,000 damage in no time. 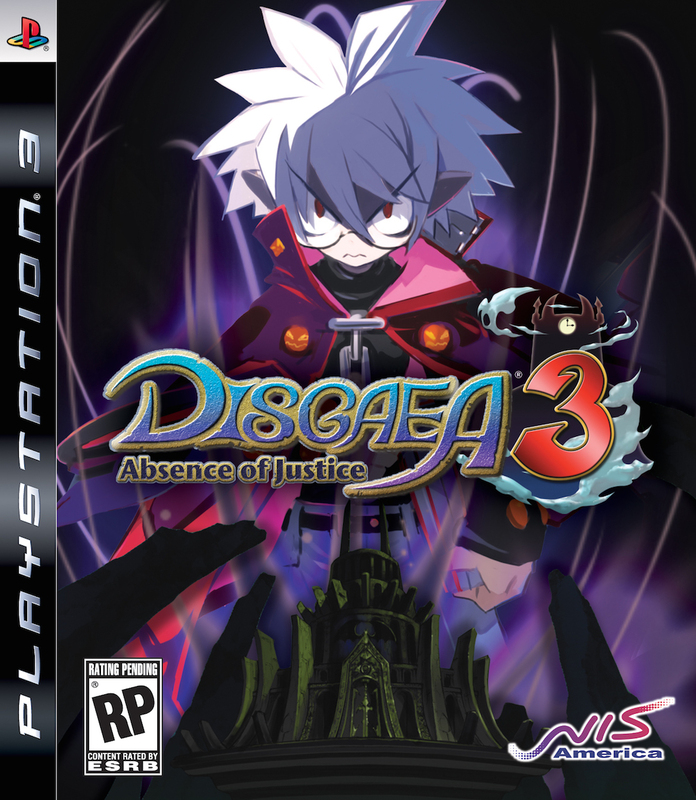 Disgaea 3: Absence of Justice is available for Playstation 3 and there is also a remake of the game available for PSVita, Disgaea 3: Absence of Detention. 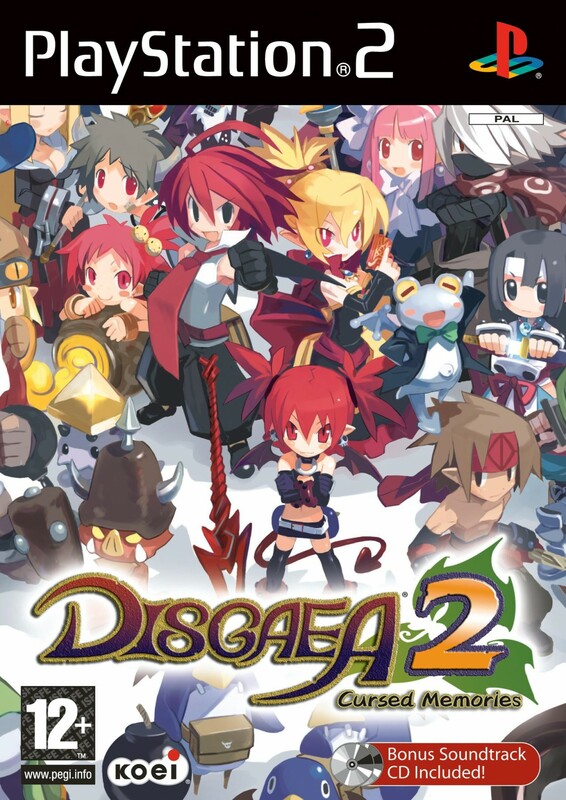 Back in 2006, the SRPG franchise: Disgaea made one of the best games for the PS2 and still today. This game is Disgaea 2: Cursed Memories. Disgaea 2: Cursed Memories tells the story of a young man named Adell that wants to defeat Overlord Zenon, in order to stop the changing of humans to demons and stealing their memories. Trying to bring Zenon to him by summoning him, Adell accidentally summons his daughter: Princess Rozalin. However because of the summon, Rozalin is now bonded to you and it is your job to find your way to Overlord Zenon and defeat him. The journey there is dangerous, but with the characters you meet and the character creator system, you won’t ever be alone. For a game from back in 2006, it still holds up well and plays almost exactly the same as future Disgaea games. The battle system is easy to get accustomed too and with the story the game delivers, battles can become very fun even with just the turn based system. However, there are also many strategic properties to this game. Geo Panels can change up what happens to your team and your enemies, the Item World can help strengthen your weapons and armor, and the Dark Assembly: where you can go to court and pass laws to change up the game. Also with Tenpei Sato composing the music, battles will be followed up with amazing tracks such as: Cyber Dance and Disgaea Rhapsody. There are many games produced by Nippon Ichi Software and this game is one of their all time best. If you want to get Disgaea 2: Cursed Memories, it is available for PS2 and PSN. For those that would like to play it on the go however, Disgaea 2: Dark Hero Days is available for the PSP and includes more content and features. Koichi Sakakibara is a new transfer student from Tokyo. His lung disorder has forced him to move in with his grandparents in a rural town known as Yomiyama, the same town that his deceased mother has attended. During his time in the hospital, he has a particular strange conversation with a girl wearing an eye patch. The conversation left him puzzled because it felt like he had talked to a ghost. What’s even more ominous is that no one in his class can see her except for him. His home classroom is also known as the cursed classroom. Twenty-six years ago, a beloved student passed away, however his classmates refused to acknowledge it. They carried on their daily lives as if he was still around. When an end of the school year photo had been taken, the image of the dead student can be found in the photo. Is there a connection between the mysterious girl and the deceased student? While anime and manga have become mainstream in the public eye, horror manga still remains a niche of their own. It is no wonder why this is a manga adaption of the novel Another rather than a standalone manga. Ayatsuji is a well known mystery and horror writer in the Japanese scene and it shows in this manga adaption. Horror in movies and manga work in two different ways. While one can be scare by a sudden shift in sound or a simple jump-scare tactic, pictures and words can rarely produce this type of emotion. What makes a horror story standout is a sense of unfamiliarity and the tension that it builds until the climax. Yukito Ayatsuji’s story and Hiro Kiyohara’s drawings have certainly done this. This story is meant to be read from start to finish in a single book like a novel. 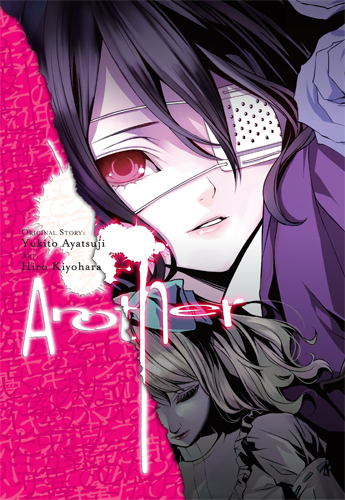 If you are buying the U.S copy of Another, it is release in a single volume with all four volumes of the manga included in one. It essentially is a one shot manga in the U.S, whereas in Japan it was released over a series of four volumes. This is a pretty good deal as you will not have to buy all four volumes and can buy it in one go. The manga’s art is a lot less focused on the gore and violence compared to the anime. What was most noticable about Kiyohara’s art in Another was through his use of symbolism and atmosphere. The reader will notice that each character’s eyes standout in comparison to their facial features. While this is a common trait in manga stylization, Kiyohara uses this design in order to promote the idea that what we see may not match with what is in front of us. Overall Another is a manga that relies less on anime tropes and cliches and focuses more on character dialogues. Its sense of horror won’t leave you shaking in your boots, however it will make you question a lot of things in reality. Japanese horror is a lot more subtle and complex in comparision to the standard jumpscare American horror that some might be more familiar with. Even if you are not a fan of horror, Another is a good manga to pickup just for the story itself. On July 4th, a new project was shown and is now being funded through a Kickstarter campaign. This project is called Red Ash. Red Ash is a series created by the minds of Keiji Inafune(Creator of Mega Man), Kazushi Ito and Masahiro Yasuma(members of the Mega Man Legends team) and more of Keiji’s partners. Taking characters from a now finished work of his, Mighty No.9, Red Ash is a 3D action-adventure game that also includes 3rd person shooting elements. The plot takes place with Beck, a young male with the ability to use his left arm as an artillery of weapons, being tasked with infiltrating the interior of the KalKanon, a mobile Citadel making its way on a crash course to the city of Great Slope. Beck isn’t alone though. Tagging along is his partner, Tyger, and their mission-assigner, Call. This game isn’t just meant to be an RPG, it is meant too have a variety of gameplay elements incorporated as more of the project is funded. However this is only Red Ash -The Indelible Legend-, there is also Red Ash -Magicicada-. Red Ash -Magicicada- is the anime series that takes the characters of the game in order to make the two adaptions parallel too each other. STUIDO4C, is the studio that will have creative freedom of the story and the original image of the main characters. The story of -Magicicada- is based upon treasure hunting, but the way the story is executed is all based upon the imagination of the creators. The main characters are the same, but their look and interpretation is completely different. The story will be directed by the mind of Yuta Sano, a 3D animator and CGI artist. The planning for Red Ash personally sounds amazing, however there are ways too make it better. Not only are the personal teams working on the series, but people are able to send in their ideas to both teams too also help with the creation of this series. Here is the link to the two Kickstarters: -The Indelible Legend- and -Magicicada-. Let’s help comcept and Studio4C reach their goals!